I love knitting and wearing cowls this fall. Why? Traditional scarves are annoying to loop and they never stay in place. Cowls are simple since they're circular. Cowls are easy and quick to make. Scarves always take much longer to knit than I think they will. Cowls are versatile. They can be worn loosely on cool days or wrapped around for extra warmth when it's cold. I like this linear cowl even more than the knobby cowl because the pure merino wool is soft and warm. I also love the color. 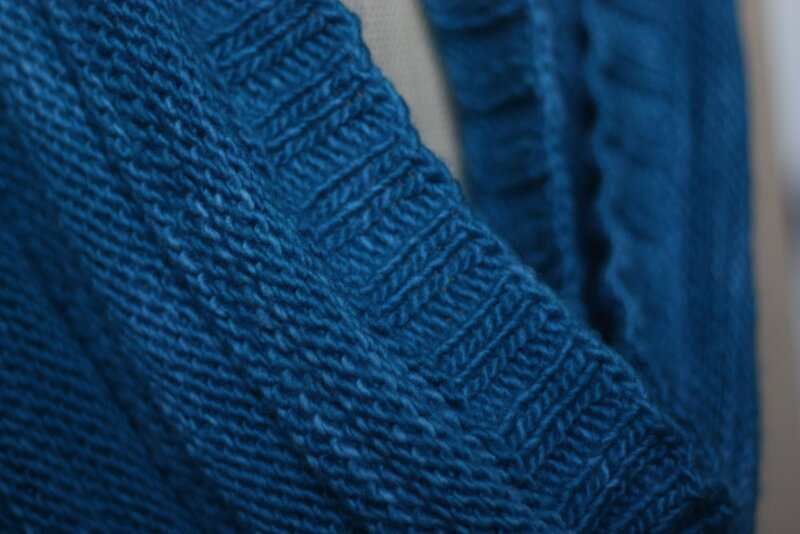 It looks similar to the yarn used in the Sand Cable Baby Blanket, but is a deeper royal blue. The Malabrigo Merino Wool comes in some beautiful colors. I splurged on two skeins of it to make this cowl last time I shopped in my local knitting store. It's so easy to work with and very soft to the touch--perfect to have close to your skin while wearing as a cowl. I had a hard time figuring out what stitch pattern to use with this yarn. I tried cables, but thought the pattern looked too busy. I tried various types of lace patterns, but didn't like them either. Finally, I settled on the simple texture and lines created with only knit and purl stitches. The pattern is simple and can be finished rather quickly. You might even have time to knit a few for Christmas gifts! We've had a pretty mild fall in Colorado. Most days have been too warm for cowls, but snow is in the forecast. I'm doing my snow dance since I'm a skier who wants better early season snow conditions. I'm also looking forward to cooler temperatures so I can start wearing all my warm knitted accessories! What should I put on the needles next? Share what you're working on this month in the comments. I need some inspiration for my next project!